It's September and the waterlilies are still blooming prettily on the pond though the lily pads are beginning to turn russet and gold colors. Here and there a red maple leaf has drifted down to lay on the sapphire blue water. 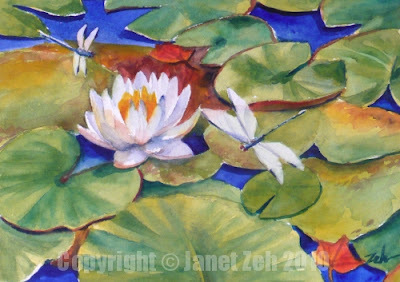 A couple of dragonflies swiftly dart back and forth above a white lily adding a bit of lively energy to this colorful piece. This painting is sold, but more of my work can be found at zehoriginalart.com. Thanks for stopping by today!